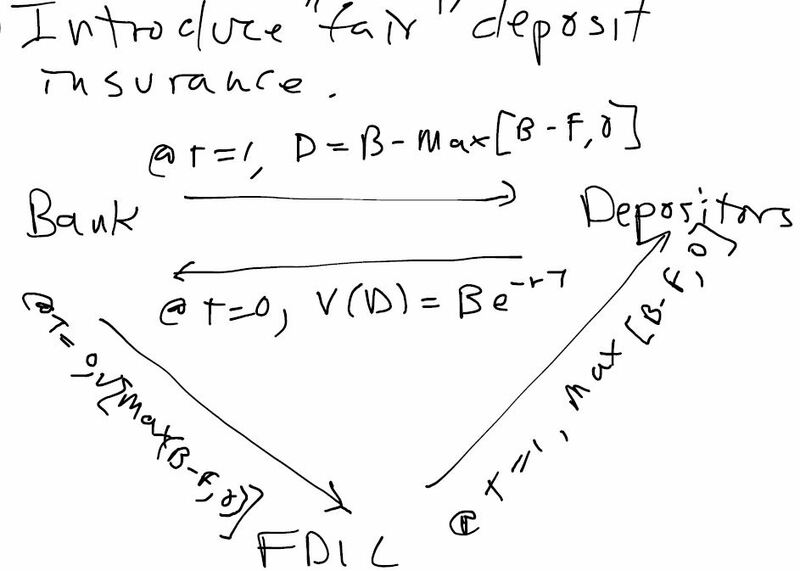 In the Credit Risk lecture note and in Problem Set 9, we study how credit enhancement of risky debt works. Examples of credit enhancement in the real world include federal deposit insurance, federally guaranteed student loans, public and private bond insurance, pension insurance, mortgage insurance, government loan guarantees, etc. ; the list goes on. (note: in the picture below, T = 1). During yesterday’s class meeting, we discussed (among other things) how contract designs and pricing strategies can “fix” the moral hazard that insurance might otherwise create. Insurance is “good” to the extent that it enables firms and individuals to manage the risks that they face. However, we also saw insurance has a potential “dark side.” The dark side is that too much insurance and/or incorrectly priced insurance can create moral hazard by insulating firms and individuals from the financial consequences of their decision-making. Thus, in real world insurance markets, we commonly observe partial rather than full insurance coverage. Partial insurance ensures that policyholders have incentives to mitigate risk. Furthermore, real world insurance markets are characterized by pricing strategies such as loss-sensitive premiums (commonly referred to as “experience rated” premiums), as well as premiums that are contingent upon the extent to which policyholders invest in safety. In competitively structured private insurance markets, we expect that the market price for insurance will (on average) be greater than or equal to its actuarially fair value. Under normal circumstances, one does not expect to observe negative premium loadings in the real world. Negative premium loadings are incompatible with the survival of a private insurance market, since this would imply that insurers are not able to cover capital costs and would, therefore, have incentives not to supply such a market. Thus, the NFIP provides us with a fascinating case study concerning how subsidized flood insurance exacerbates moral hazard (i.e., makes moral hazard even worse) rather than mitigates moral hazard. It does this by encouraging property owners to take risks (in this case, building on environmentally fragile lands that tend to flood) which they otherwise would not be inclined to take if they had to pay the full expected cost of such risks. There are many other examples of moral hazard created by insurance subsidies. Consider the case of crop insurance provided to farmers by the U.S. Department of Agriculture. The effective premium loading on federally provided crop insurance is typically quite negative (often in excess of -60%), thus putting crop insurance on a similar footing to flood insurance in terms of cost compared with actuarially fair value. Just as mis-priced flood insurance effectively encourages property owners to build in flood plains, mis-priced crop insurance incentivizes farmers to cultivate acreage which may not even be particularly fertile. Economists have long known that people are risk-averse, yet the willingness to run risks varies enormously among individuals and over time. Genetics explains a third of the difference in risk-taking; e.g., a Swedish study of twins finds that identical twins had “… a closer propensity to invest in shares” than fraternal ones. Upbringing, environment, and experience also matter; e.g., “…the educated and the rich are more daring financially. So are men, but apparently not for genetic reasons”. “Exposure to economic turmoil appears to dampen people’s appetite for risk irrespective of their personal financial losses.” Furthermore, a low tolerance for risk is linked to past emotional trauma. This week’s Intelligent Investor column in the Wall Street Journal presents an homage to the memory of Jack Bogle, the founder of Vanguard Group. Mr. Bogle passed away this past Wednesday at the age of 89, and as the inventor of index investing, he is arguably one of the most important public figures in the practice of finance of the past 50 years. Burton Malkiel’s WSJ op-ed in today’s paper entitled “The Secrets of Jack Bogle’s Investment Success” is also a must read! From November 2016 through October 2017, Financial Times writer Tim Harford presented an economic history documentary radio and podcast series called 50 Things That Made the Modern Economy. This same information is available in book under the title “Fifty Inventions That Shaped the Modern Economy“. While I recommend listening to the entire series of podcasts (as well as reading the book), I would like to call your attention to Mr. Harford’s episode on the topic of insurance, which I link below. This 9-minute long podcast lays out the history of the development of the various institutions which exist today for the sharing and trading of risk, including markets for financial derivatives as well as for insurance. during this period moved inversely 78.4% of the time. 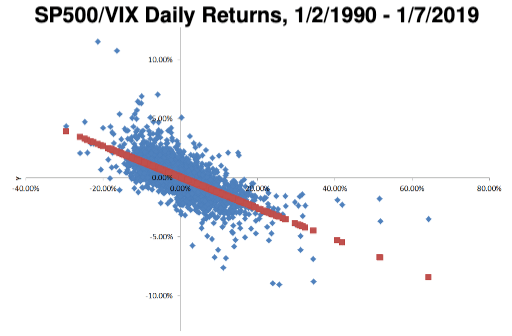 You can see how the relationship between the SP500 and VIX evolves prospectively by entering http://finance.yahoo.com/quotes/^GSPC,^VIX into your web browser’s address field. A subscription to the Wall Street Journal is required for Finance 4335. In order to subscribe to the Wall Street Journal (WSJ) for this semester, go to http://r.wsj.net/j73NM. Your WSJ subscription includes access to print, online, tablet and mobile editions, and only costs $1 for a 15 week subscription. At your option, you may choose to receive both the digital and paper versions of WSJ or only the WSJ digital version. Throughout the semester, I will often reference specific WSJ articles on the course blog and in class. Finance 4335 topics (as well as topics in many of your other business school courses) come to life in the world outside the Baylor bubble when you read make a habit of reading the WSJ on a regular basis. Furthermore, if you expect to interview for jobs or internships anytime soon, reading the WSJ will give you a leg up on the competition, since you will be better informed and have more compelling ideas and insights to share with recruiters.